Electrical Completion Day is quickly approaching, due to the encroaching expiration of our permit! In anticipation of seeing our electricians next week for the first time in almost a year, we’ve been busy getting our owner-supplied supplies ordered… and that includes our push button switches! These are going in our “public” spaces instead of the modern decora-style we opted for in the bedrooms, main bathroom and third floor. 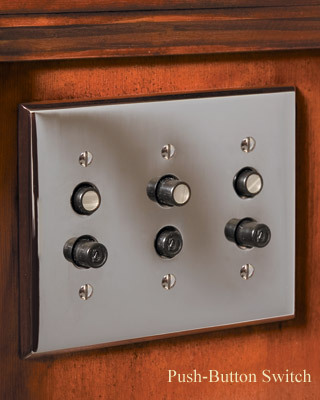 We ordered directly from Classic Accents which is the only manufacturer still making these switches (although sold by other period home/restoration websites and Kilians in Chestnut Hill). Of course you can’t have a switch without a switch plate cover… so we ordered some of those too. Ours will be less decorative than this example and are wider, multi-switch plates but this gives you an idea. As for finishes, we’re using stainless in the kitchen, oil rubbed bronze in the living room and powder room, and bronze in the rest of the “public” spaces (front/ upper halls & dining). Now moving on to prepping for our electricians! Before final inspection, they’ll finish installing every outlet, switch and at least a “temporary” light fixture… no dangling bare bulbs allowed!